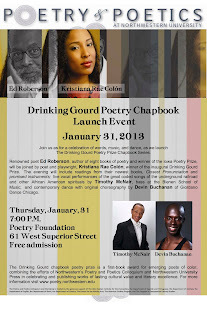 The Drinking Gourd Chapbook Poetry Prize Launch is this Thursday, January 31st at 7:00 p.m.. We will host an evening of poetry, song, and dance at The Poetry Foundation's auditorium (61 W. Superior St., Chicago) to celebrate our first annual Drinking Gourd Chapbook Poetry Prize for emerging poets of color. Kristiana Rae Colón (our prizewinner) and renowned poet Ed Roberson will read from their new chapbooks, entitled promised instruments and Closest Pronunciation. Their readings will be punctuated by a vocal performance of songs from the tradition of African American spirituals by Timothy McNair, bass at the Bienen School of Music, and original dance choreographed by Devin Buchanan from Giordano Dance Chicago. The event (like all our events) is free and open to the public. Ed Roberson, Distinguished Artist in Residence, taught from 1990-2003 at Rutgers University, and from 2004-2006 at Columbia College in Chicago. He was the recipient of the Shelley Memorial Award from the Poetry Society of America in 2008, and was one of three writers honored at the recent Literature, Culture, & Critique conference, organized by Callaloo magazine.Roberson is the author of To See the Earth Before the End of the World (2010); The New Wing of the Labyrinth (2009); City Eclogue (2006); Atmosphere Conditions, winner of the 2000 National Poetry Award series; Just In: Word of Navigational Change (1998); Voices Cast Out to Talk Us In, winner of the 1994 Iowa Poetry Prize; as well as earlier books, including Lucid Interval as Integral Music (1984); Etai-Eken (1975); and When Thy King Is a Boy (1970). 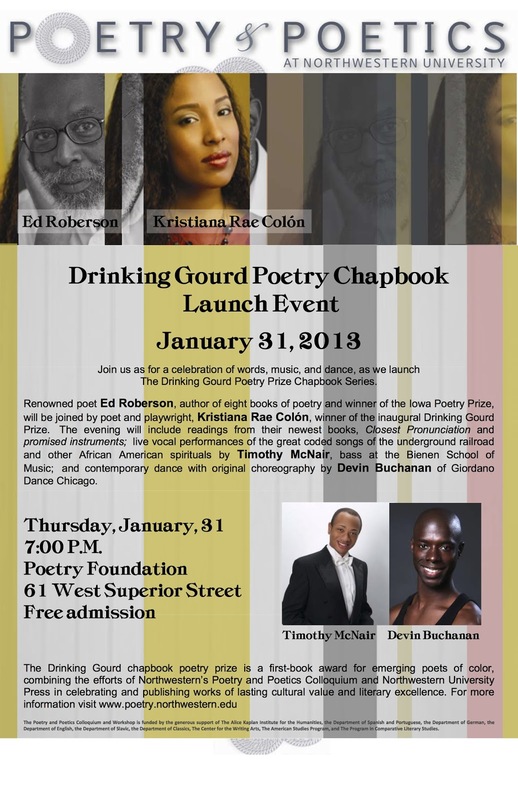 Kristiana Rae Colón is a poet, playwright, actor, and educator living in Chicago. She has been featured on the HBO television series Def Poetry Jam and on WBEZ’s Chicago Public Media. Her work has been nominated for a Pushcart Prize honoring the best writing published in small presses, and it has been anthologized in Not a Muse (2009), Best of the Web 2010, and the upcoming collection Chorus: A Literary (Re) Mixtape, an anthology of poetry by young people edited by Saul Williams and Dufflyn Lammers. Devin Buchanan is a dancer with Giordano Dance Chicago. Trained at The Ailey School in New York City in a variety of dance techniques, including Horton, Devin also created "Winter’s Bleu" and "Do You Trust Your Friends," works that were performed by his colleagues in The Ailey School’s "Global Harmony" and "Fall Fest." In May 2010, he was accepted into "The Fraulein Maria Project," which gave him the chance to continue his work in modern dance and tour the USA. This is Devin’s second season with GDC. Timothy McNair is a vocalist and Eckstein scholar at Northwestern's Bienen School of Music. He began his acquaintance with music through his studies of saxophone and double reed instrument, but began singing in the choir at the age of 17. He has studied with Mezzo-soprano, Victoria Livengood as a vocal major at East Carolina University and received further training at the University of North Carolina School for the Arts with Dr. Marilyn Taylor, where he was the 2008 University of North Carolina Fletcher Scholar. Kenyan poet Clifton Gachagua’s manuscript Madman at Kilifi has been selected by the African Poetry Book Fund & Series for the Sillerman First Book Prize for African Poets. As the winner of the First Book Prize, Gachagua’s Madman at Kilifi will be among one of the four books to be published by the African Poetry Book Series in 2014. The Sillerman First Book Prize for African Poets is awarded to African poets who have not previously published a book-length collection. The prize includes a $1000 cash award and publication with the University of Nebraska Press and Amalion Publishing in Senegal. Kwame Dawes, Series Editor of the African Poetry Book Fund & Series, notes that Madman at Kilifi was selected because, “Above all, there is a distinctive voice here. This is a difficult trait to define, but when it emerges as it does here, it is striking for its originality. There is a fresh and adventurous intelligence and delight in Gachagua’s poems. The judges are all thrilled with this manuscript and we are expecting great things from Clifton Gachagua." 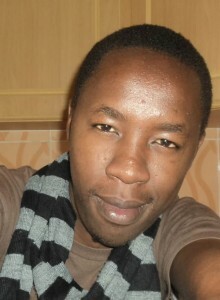 Clifton Gachagua is a writer, screenwriter, and filmmaker based in his native city of Nairobi, Kenya. Gachagua’s poetry has appeared in Kwani? 06, Saraba, and on his blog “The Drums of Shostakovich.” His prose has appeared in the online journal Storymoja, the anthology AfroSF, and a collection of science fiction writing from Africa. He has recently completed a novel and is currently developing a French-Nigerian feature-length film. He holds a bachelor’s degree in biomedical sciences. The Sillerman First Book Prize is named after philanthropists Laura and Robert F. X. Sillerman whose contributions have endowed the establishment of the African Poetry Book Fund & Series. The African Poetry Book Fund & Series promotes the writing and publication of African poetry through an international complex of collaborations and partnerships. The Fund and its partners offer support for seminars, workshops, and other publishing opportunities for African poets. The University of Nebraska-Lincoln’s literary journal Prairie Schooner manages the annual Sillerman First Book Prize for African Poets as a partner in the African Poetry Book Fund & Series. In addition to Dawes, the Series Editor, who is of Ghanaian birth, the editorial board for the African First Book Fund is comprised of the South African poet Gabeba Baderoon, the American novelist John Keene, the Nigerian poet and novelist Chris Abani, the Egyptian-American poet Matthew Shenoda, and Bernardine Evaristo, award-winning novelist and poet from the UK.